The Historic Monuments of Ancient Kyoto (Kyoto, Uji and Otsu Cities) represent the imperial capital of Japan and formed the center of Japanese culture for thousand years (from 794). This still can be seen in the religious wooden architecture, and the landscape gardens. After two visits I still only have seen a fraction of all the temples in Kyoto. Most remarkable are the big differences between them (probably caused by the fact that they were built during several periods within the long heydays of Kyoto). For a first-time visitor I would recommend Ginkaku-ji (the Silver Pavillion), Ryoan-ji (to sample a fine Zen garden) and Daitoku-ji (no worldheritage status, but a lovely complex to walk around). Though not as impressive as Kinkaku-ji, Ginkaku-ji (The Silver Pavilion), is a place I highly recommend visiting. The complex sits at the foot of the mountains and so feels more secluded than many of the other sites, and it is an exemplary display of the Japanese landscape design which is famous across the city. Enryaku-ji, though harder to access (one must drive or take the train to Sakamoto, then take the Funicular up the mountain) is perhaps the most surreal place I have ever visited. There is very little sound except for the periodic ringing of the peace bell, and the clouds often settle around the height of the temple, creating a misty aura, as if you've stepped into another world. Most people will only visit the main temple complex by the entrance, however, I highly recommend visiting the second area, where you can see Shaka-do, an isolated temple surrounded by trees which can make even the most atheistic feel a sort of spiritual presence. 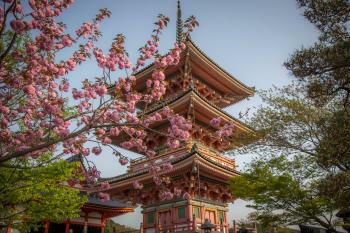 No single description or image can encapsulate the sheer beauty of Kyoto's ancient temples. On the one hand, it's a large and fast-paced modern city and that surprised me. I was taken aback when walking through shiny metal buildings and city blocks to find my guesthouse. But once you realize that Kyoto is a modern city with an ancient history preserved within several districts of the city, it's easier to find the fascinating areas and the deep history. I spent four full days exploring the city and about 10 hours per day of that was spent just walking and navigating to the many things on offer. And while that may seem like a lot, the temples and gardens are diverse and unique, meaning you don't reach temple fatigue quite as much as you might in other areas. Since the city was founded 794 AD, the temples range through a large span of history, meaning the styles, architecture, and aesthetics are all very different. And Nara is an easy day trip from the city, so it's worth heading there for one of your Kyoto days as well! Like many of the European world heritage sites which encompass an entire city (Paris, Rome, etc) Kyoto is probably the grandest and most encompassing world heritage site in Japan. Kyoto was specifically spared bombing in WWII by the allies because of its history. Unfortunately, many of the buildings did not survive the post-WWII modernization fervor in Japan. Nonetheless, there is plenty to see in Kyoto and you can easily spend several days in the city viewing historic shrines and temples. This is a must see for any tour of Japan. Read more about the Historic Monuments of Ancient Kyoto on my website. Within the city, there are 17 specific places that have been designated as part of the official Kyoto listing on the UNESCO World Heritage List. It’s impossible to see them all in a day. I think you’d be hard pressed to see them all in three days even. If you’re the kind of person who likes to explore things in depth then you’ll need to leave yourself enough time to properly understand a city as culturally-rich as Kyoto. I gave myself just one day in Kyoto, which I now regret. It’s easy to get templed-out in this region of Japan and I fear that was beginning to happen to me. But I still managed to see some of the most important temples and shrines… and finished the day, as the sun set, at the most beautiful of all the sights, Kiyomizu-dera. I went to Kyoto in February 2016. Of the 4 WHSs I took in on my Japan trip, Kyoto captured the essence of Japanese heritage the best for me. A good point to get your bearing and view many of the temples is the rather expensive Kyoto Observation Tower. Also note that the famous Fushimi Inari shrine is NOT inscribed, though is still fun to visit. Byodo-in: We took the Nara line 30 minutes out of Kyoto to Uji station, where it seemed that every other shop was a specialist in matcha. Byodo-in temple is surrounded by a tranquil pool of water. This was the first time on our trip that we were required to take off our shoes, which is something you will find very often when visiting Japanese cultural sites. The museum includes 52 wooden bodhisattvas, which seem vaguely similar to angels in Christianity. Ujigami-jinja: across the wide Uji river from Byodo-in is this small guardian shrine. It was the lowest-key and the quietest of the sites we visited in the Greater Kyoto area. So quiet, in fact, that it joined the select list of World Heritage Sites at which we have found ourselves to be the only visitors. Kyo-o-gokoku-ji (To-ji): a short distance from Kyoto’s main railway station in the centre of town, Toji temple is home to the tallest pagoda in Japan. The site features a couple of single-storey buildings too: the Kodo (lecture hall) and Kondo (main hall). Each of these contains a selection of fabulous gilded statues positioned as a physical representation of the cosmology of Buddhism. Hongan-ji: A brisk walk north took us to another temple close to Kyoto station. Free to enter, at Hongan-ji we saw two large decorated halls into which ordinary Japanese would come to pray. The floors are covered with tatami mats, so again one must take off shoes to enter. It was very peaceful inside these buildings, and it almost felt as if we shouldn't have been in there, being the non-Buddhists that we are. Tenryu-ji: after a morning at Himeji Castle we darted back to Kyoto in order to visit another shrine. This time we picked Tenryu-ji, which is on the western outskirts of Kyoto, close to the hills that have halted the city’s almost inexorable sprawl. This temple was everything a tourist would want one to be: pretty, peaceful, garden, pond, raked gravel, bamboo, tatami mats, paper walls and quiet. Nijo-ji: unlike some of the other temples in Kyoto, Nijo Castle is not a small and indoorsy one! Surrounded by a moat, it is a formidable block in the heart of the city. We walked around the maze of corridors inside the Ninomaru Palace, squeaking over the nightingale flooring. The surface was deliberately designed to ‘chirp’ when walked on, in order that intruders would not be able to sneak up on the emperor unannounced. I visited this WHS in November 2009. The highlight of my visit was surely the Golden Pavilion and the surrounding Japanese gardens. It was the centre of Japanese culture for more than 1000 years and the imperial capital of Japan. Surely, one of Japan's top WHS. Kyoto has been the capital of Japan for almost 1000 years and still remains the cultural center of the country. I have spent 4 days visiting Kyoto amazing world heritage listed buildings. I have visited 11 sites out of 17. Among them, those that really astonished me are Nijo jo castle with its imperial palace, full of decorated rooms, Kinkaku ji with the Golden Pavilion and To ji with its 5 story pagoda which is the tallest one in Japan. Kyoto is the heart of Japan and houses some of the finest testimonies of ancient Asian architecture with its shrines, temples, palaces and zen gardens. The place is amazing and full of splendorous treasures. The image shows Nijo Jo castle (exterior white fortifications and interior buildings), Kiyomizu Dera entrance gate, To Ji pagoda, Byodo In temple and Kinkaku Ji Golden Pavillon. Bicycles are a convenient transportation alternative. Nearly all sites except Kiyomizu-dera have free bicycle parking. With a mountain bike it is possible to visit all interesting sites east of the river in one day. Use the paths parallel to the river to avoid traffic. 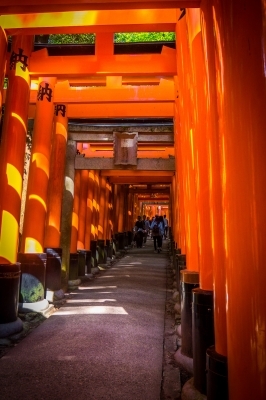 You can even reach Fushimi Inari Taisha in 20 minutes or so from Gion. Ginkaku-ji was undergoing some small renovation but was still one of my favorites. 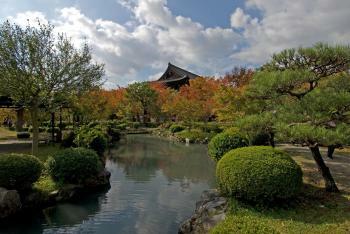 I also loved Byôdô-in Uji. I experienced the people of Kyoto to be overwhelmingly friendly – from curious passengers in city buses to the staff of the excellent tourist information in Kyoto station. Kyoto is a truly unique place. Don't miss places like Sanjûsangen-dô and Fushimi Inari Taisha (although those are not WHS). I visited Kyoto in April at cherry blossom time - husband was an invited guest and we were taken around the city by Japanese people. This is a rare time to see the city because all the streets and shrines are surrounded by cherry blossoms. One shrine we visited had 2,000 cherry trees in bloom and it is a tradition for the Japanese to spread blankets under them and get drunk and sing--their version of tailgating! 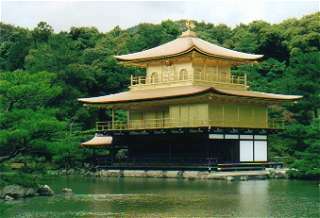 The grounds of the Golden Shrine sits over the water and is 1,500 years old. The landscaping there is beautiful and one can see the shrine from many angles. One bonsai tree was over 800 years old and shaped like a ship. I managed to see all except on the list of 17. Missed the Saiho-ji (moss temple)and Enryaku-ji on Mount Hiei. Otherwise, everything was memorable, but some places more than others. The ones in Kyoto I'd recommend are: Ginkaku-ji, Nijo-jo, Daigo-ji (Sampo-in), Nanzen-ji, Kiyomizu-dera, To-ji (especially for the flea market on the 21st of every month), Kitano Tenman-gu (also has a flea market on the 25th of the month), Ryoan-ji (if you can tolerate crowds), and the Kamigamo & Shimgamo Shrines along the Kamo River. 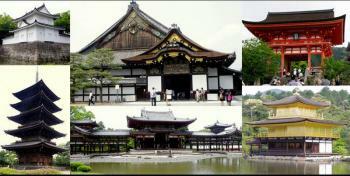 In Uji City: Byodo-in and the Ujigama Shrines. That only leaves three you could pass over, and another two I didn't get to visit. The bus inside Kyoto is convenience but their speed are slow. I suggest to go to Higashiyama region. 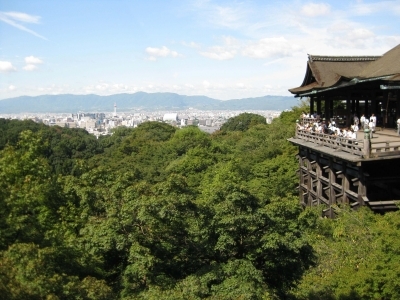 Visit Kiyomizu Temple and follow the route of philosophy until Ginkakuji Temple. The best time is in April and the cherry blossom on the route of philosophy. I have spent a great deal of time in Kyoto and it never ceases to break my heart. The city itself is an utter monstrosity, a nightmare mess of urban planning. There are some wonderful spots in the city, but these are marred by the city itself. Many of the temples, gardens and shrines are almost ruined by tacky souvenir stalls that seem to dog this country's tourist sites. I have visited virtually all of the temples and sites inscribed on the list and would recommend the following:- (1)Byodo-In, one of the few remaing Heian period buildings left in Japan. It is a real gem. (2) Enryaku-Ji. A wonderful mountain-top temple that has beautiful views over Lake Biwa. 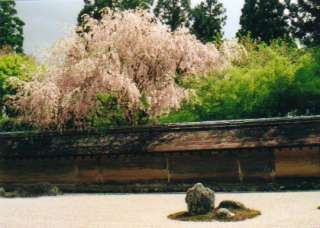 (3) Nijo-Jo. One of the most outstanding palaces remaining in Japan. 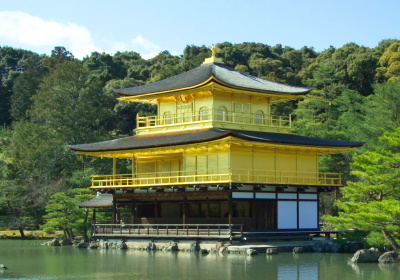 The most visited temple is Kinkaku-Ji - the Gold Pavillion. I find this place rather gaudy and overdone. It is a relatively recent creation, built in 1955 after the original was burnt down. Nishi-Hongan-Ji is currently undergoing a massive face-lift and rebuilding project. The Kondo Hall will be off limits for several years. Ginkaku-Ji (The Silver Pavillion) is looking a bit worse for wear these days and could use a lick of paint. Re-building is something that always has to be born in mind with Japanese temples - what you are looking at may be advertised as being 700 years old, but it could easily be a modern re-construction. I went to Kyoto 2 summers ago as a 3 week study abroad program for my University. it was one of the most experiences of my life. Here I saw things that I had previously only seen in the textbooks of my Arts of Japan class. Kinkakuji Temple stands out in my mind due to the fact that even if you are a terrible photographer, you just can't take a bad photo of this site. It is gorgeous! One note for the inexperienced traveller, be prepared to see some of the most incredible gardens. Every temple has a spectacular garden that deserves some film space. One thing I remember is that hydrangea bushes are common and the Japanese red maple is a staple. Also be prepared for Japanese high school students. Nearly every major temple I went to had a huge group of high school or elementary school kids. Especially if you are an American male, these kids will take interest and often ask help on an English assignment. They are very cute and sometimes if they gather the courage, they will ask for a picture. Also take off your shoes before entering some of the temples. Also don't worry about rude Japanese because for the most part they are very polite towards foriegners so don't worry about how bad your Japanese is because they are fairly understanding. Famous suicides: Minamoto no Yorimasa. He killed himself by seppuku in Byodo-in, one of the listed monuments in Uji. His seppuku was the first recorded to have been carried out as an alternative to surrendering to enemies. Toyotomi Hideyoshi: Inspired by the dazzling Kinkaku (golden pavilion) temple in northwestern Kyoto, he also constructed a fabulous portable tea room, known as kigame no zashiki ("golden chamber"), covered with gold leaf and lined inside with red gossamer. Using this mobile innovation, he was able to practice the tea ceremony wherever he went, powerfully projecting his unrivaled power and status upon his arrival. Unusual Entry Requirements or Restrictions: Visitors to Saiho-ji Temple have to undertake a period of Zen meditation and copy or chant Buddhist sutras before entry. Built elsewhere as a full size replica: Byodo-in Temple. Built in 1968 in the Valley of the Temples Memorial Park on O'ahu Hawaii. It operates as a non-denominational temple within the park for worship, weddings etc. Undergoing Restoration or Repair: Kiyomizudera Temple has restoration projects under way that are expected to be completed in 2019. Currently, the Okunoin Hall, Amida Hall, and Shaka Hall are being renovated. Developed since inscription: In 2001 Uji Byodoin Temple opened its modern museum mostly built underground of the temple complex. 345 Community Members have visited.